The SAM Putt Lab is worldwide the best system for a complete putt analysis and is used by more than 100 players on the European Tour and the US PGA Tour; Tiger Woods is one of them. The SAM Balance Lab is first-class technology to track the ideal body weight transfer during the golf swing. The result: You can optimize your movements in detail and improve at one stroke. The Golf Lounge is one of the best-equipped golf academies in Europe. You can target your individual abilities and strategies with the technologies for analysis very exactly. SAM PuttLab for example, gives you scientifically proven real-time feedback regarding the relevant parameters of your putting movement. 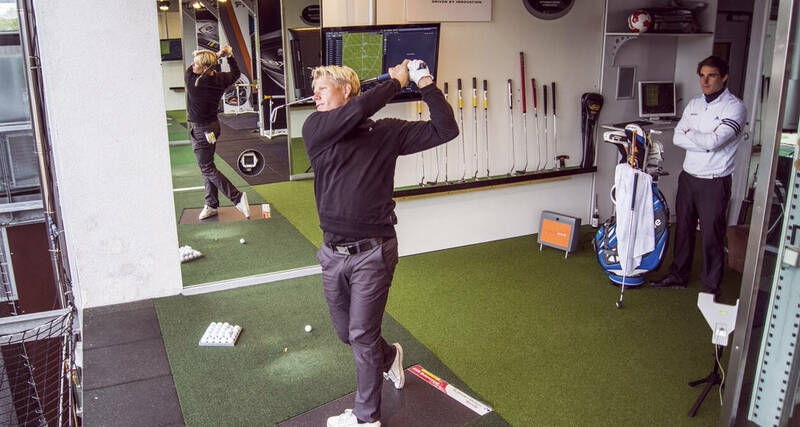 SAM Putt Lab is state-of-the-art technology for tracking the ideal weight transfer during your golf swing. 2500 sensors provide for precise tracking results. The sensors in the ground plate measure the weight transfer during the address position, as well as during back swing and the follow-through motion. The results can lead back to possible swing mistakes and show you precisely, how you can improve. In the end, you gain a consistent swing motion and an ideal club speed. Please give us a call when you have questions or make an appointment. We are looking forward to meeting you.